Soccer is a two column wordpress template dedicated to the game of Soccer (known as Football to the non-US world). This wp theme would probably be better classified as two column, since the middle column is actually an image and serves only for cosmetic purposes. It features a football player sitting on grass with the ball placed in between his shoes. Some amazing sunset lit clouds are visible in the background. The wordpress sidebar is on the left side and contains all the usual wp menus while the main content area is on the right. Soccer wordpress theme was designed by Web2feel. 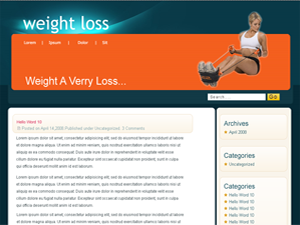 A Striking health and body building based wordpress theme that focuses majorly on body building. This is an extremely serene wordpress theme that has the perfect blend of various shades of grey color. The theme has a large and prominent header with a clear and unique orange search box that contrasts well with the various shades of grey. This wordpress theme has two fixed width columns and a 3D effect sidebar. The theme has a turquoise blue and white navigation bar. The content area in the theme has rounded edges that give it a classy look. The theme is XHTML and CSS validated by the W3C standard. A simple, yet elegant looking wordpress theme with a health based header. The theme is a fixed width theme with two columns of diverse sizes. The theme has the perfect color blend of light blue and grey with the contrasting orange shade that gives it a very decent and serene appearance. The theme has a transparent body with certain glassy features on the navigation bar. 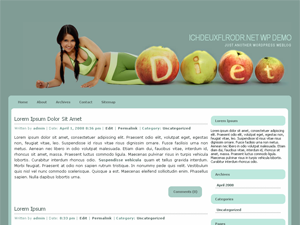 The theme color can be altered as per the requirements of the user. The theme is extremely inspiring and most suitable for the fitness or health related websites like yoga, weight loss etc.